By Travis - South Africa - 24 Nov/03 - Viewed 1845 times. Our last morning in Durban was spent finalizing our plans and flights for our safari in eastern Africa in December, and arranging car hire for our remaining time in South Africa. As we headed toward the Drakensburg Range, we stopped off at Pietermaritzburg for lunch at a Chinese restaurant. On the way back to the car, we passed a dodgy shop advertising, among other things, impotence solutions. Foreseeing an abundance of humorous possibilities, we stepped inside--Abi as the supportive spouse, desperate for a cure, and myself as the semi-embarrassed, yet painfully frank, E.D. sufferer. After the clerk buzzed us in through the gate on the front door, I asked the big, burly guy behind the counter about the impotence solutions we had seen advertised on the front of the establishment. "You want what?" I repeated my inquiry. It may have been my accent that fouled him up, but when he tried to repeat my request back to me it came out as an unintelligible cross between "impertinent" and "incontinence" that we nearly lost it. I said, "No, impotence...you know, problems down there." A light went on, "Oh...oh, let me have you talk to Rayanne, she's the expert on that." Thinking this introduction could encompass anything from a PhD in psychology to a lifetime of marital frustration, I eagerly waited for Rayanne to get off the phone. Once she freed up and asked what she could do for us, I asked about the impotence solutions we had seen advertised. "Well, we have just the thing," she jumped in. "Because, I've been on everything from ginko boloba to Viagra and nothing seems to bring it to life." "Now, are you looking for a long-term cure, or something for a jump-start to take just before, because we have these Rhino pills that you take about 45 minutes before you're ready to go." "No ma'am, I mean that would be nice, but I'm too young for this kind of thing, you know. I need a long-term solution." I was about to relate some outlandish home-remedies I had prepared to try and shake up Rayanne the Expert, but she started in on the ingredients (among others, horny goat weed! ), the effects and the endorsements of Impotex so quickly, thoroughly and professionally, that I couldn't deliver my spiel. We took a brochure and I mumbled something about emailing my doctor before we left Rayanne in peace. The rest of the afternoon we spent on the road travelling to the southern region of the Drakensberg, situated on the eastern border of Lesotho (a rural country, consisting of a high plateau and surrounded by the territory of South Africa on every side). 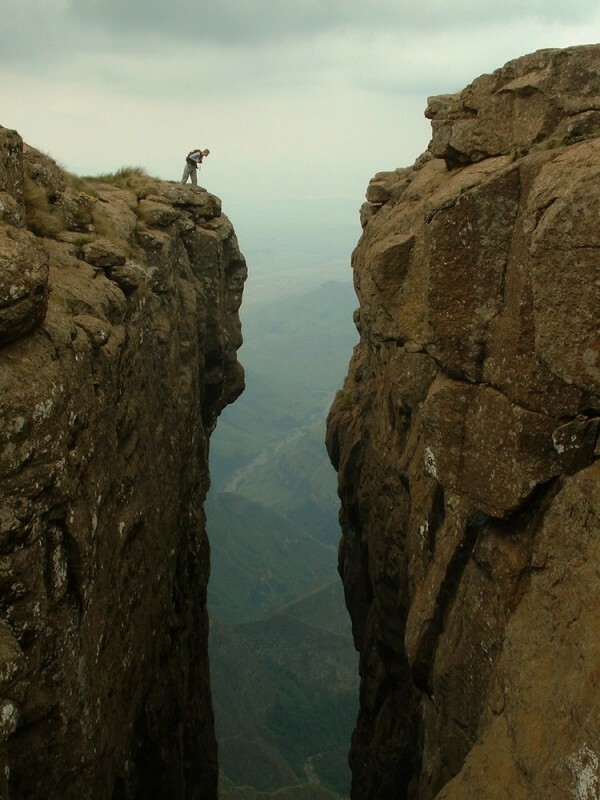 The Drakensburg are not really mountains, but a crescent-shaped line a couple hundred kilometers long where the high plateau of Lesotho drops off 500-2000 meters into the lower plateau of south-central South Africa. We found accommodation along the road to Sani Pass, the highest border crossing between South Africa and Lesotho, which access is limited to 4x4 vehicles for the last few kilometers. We drove as far as we were allowed in our Mazda 323, and even that far up the pass was a slow and bone-rattling experience. We also took a short walk to a waterfall in the area and found a field dotted with white trumpet lillies in full bloom. The electricity was out at the hostel when we returned, so we had a nice candlelight conversation with these Swedish women in their 20s, who were doing volunteer work in Cape Town. The next day we drove over the dirt roads and through the farms, villages and small towns at the foot of the Drakensburg. We stopped at a national park near Giant's Castle for a two hour hike, mostly just to stretch our legs out because you can see most of what there is to see just driving around. We were caught out in the beginning of a thunderstorm, which turned into a downpour as we ran the last kilometer to the shelter and parking area. We continued by car to Royal Natal National Park at the northern edge of the Drakensburg range. The backpackers hostel we had chosen to stay at based upon the guidebook's recommendation had relocated a few kilometers down the road; however, that location was booked full for the night, so they let us stay in one of the cabins at the old place. It was in good shape, with a nice view over the valley and very quiet--we had the whole complex to ourselves, save one South African couple and three German medical students doing their residency in Durban, where they "get lots of practice because of all the gunshot wounds." The next day we had one of the most incredible experiences of our entire trip. We drove about an hour from the backpackers to the car park at Sentinel Mountain in Royal Natal National Park. After hiking an hour around the back of Sentinel and overlooking brilliantly green valleys dotted with late-spring wildflowers, we came to a deadend at a set of cliffs--dead ends, except for the ladders made from metal rungs welded to heavy metal chains anchored at the top and dangling over the sides of the cliffs. It was windy and not an altogether enjoyable experience climbing to the top. The top of the plateau was covered in clouds, and more were blowing in from the west, obscuring our view of a multi-tiered waterfall on the opposite side of the ravine from us. We found a sheltered area and had a snack, and waited until we could get a good photo of the waterfall. Then we followed a trail along a quiet stream for thirty minutes across the top of the plateau, covered in short grasses, wildflowers and an occassional low bush. At the eastern edge of the plateau, this quiet stream tumbled over the precipice, becoming Thukela Waterfall--at 948 meters, the second highest waterfall in the world. The Thukela descended in four principle drops, connected by ribbons of white foam winding through the green terraces breaking the vertical drops of the Amphitheater. As graceful and seemingly endless as the Thukela Waterfall was, standing at the edge at the top of the Amphitheater was breathtaking--the most marvelous natural vista I have ever encountered. Sentinel Mountain (a trapezoidal peak) anchored the left end and a set of rocky pinnacles terminated the Amphitheater nearly five kilometers away to the right, a concave, jagged cliff line stretched between the two, and to the front, nothing but air until the valley formed 1000 meters below. With a view of 180 degrees from left to right and 90 degrees from straight ahead to straight below, it is impossible to take a photo that recreates the breadth, depth and scope of sitting at the edge of the Amphitheater (the hazy conditions didn't help the photos we did take). We walked along the edge for a couple of kilometers, taking in the different views and stopping for lunch overlooking the Thukela. Back across the plateau, back down the chain ladders, back around Sentinel Mountain and back to the car, just as a thunderstorm was brewing at the top. That night we stayed in the same cabin and enjoyed having the entire facility to ourselves this time. We drove to Sabie the next day, a small town on the eastern edge of the South African highlands in Mpumagala State, just before the rapid descent into the low bushlands and savanna of Kruger National Park. Because of this geography, Sabie is surrounded by waterfalls, and we spent the following morning touring four of them, each involving a fifteen minute walk through dense forests to approach the base of the falls. At 11:00 a.m. we had our appointment to abseil (rapel to us Americans) a 25 meter cliff along the edge of Sabie Falls. Abi went first and I followed. I was concentrating too much on the technicalities of the abseil to fully enjoy this unique perspective on the falls, but it was fun to rapel again after a 10+ year hiatus. The bottom of the abseil ended at the pool formed by the falls, where the end of the rope slipped through the caribeaner, freeing you up to swim to the opposite shore and take the trail back to the top. We changed into dry clothes, ate a quick lunch and hopped in the car. The afternoon was spent driving to Phalaborwa, a small town at the western edge of Kruger National Park. Along the way we stopped several times to see waterfalls and various overlooks of Blyde River Canyon. A couple of areas were completely obscured by fog rising up from the valley below, but others offered nice views. We found a nice place to stay in Phalaborwa, with a TV and, more importantly, air conditioning since it was much hotter in this lower elevation.